One of the more interesting parts of the Left Elevator is the area where the trim tab is attached. 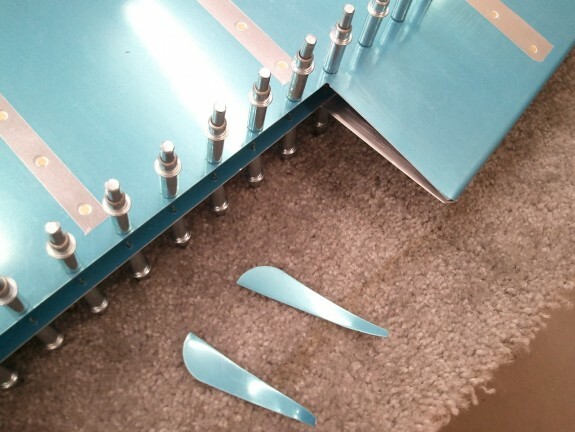 On the inboard edge of the elevator skins (and on the tab itself), Vans leaves little ears that need to be folded over to close off the end of the skin. MANY builders have completely mangled the skins trying to accomplish a clean bend and have to settle for a not so nice look to this step. I read several other build logs, researched on VansAirforce, and gave the steps a healthy think through. The same “many” builders that experienced bad bends and did not want to live with the ugly result have sometimes simply cut the bad bends off and fabricated a little biblet to replace the ears. Some other builders have opted to just do the riblet as a first attempt without risking the initial heartache of the bad bend. One example of a builder that opted to simply do the riblet from the start is Jason Beaver. I review his site every so often as I go along (as with others) and I liked his solution. I opted to do the same. So, today, I committed to it and lopped off the elevator skin ears.